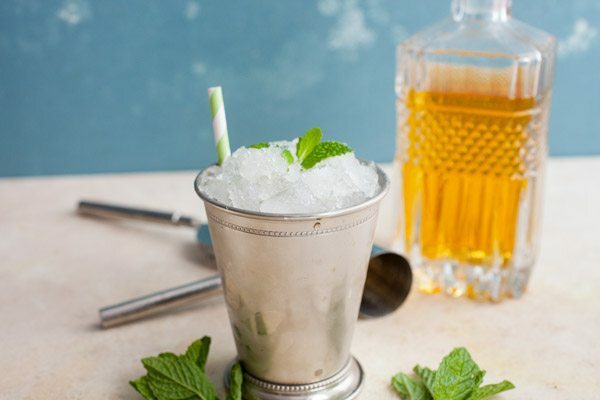 If you need a refreshing cocktail this spring, look no further than this Mint Julep Recipe. It’s an easy cocktail to make, and it’s so delicious! If you’ve ever been to the Kentucky Derby, or just watched it on TV, you’ve probably seen people in large hats carrying around big metal cups overflowing with ice and bourbon. 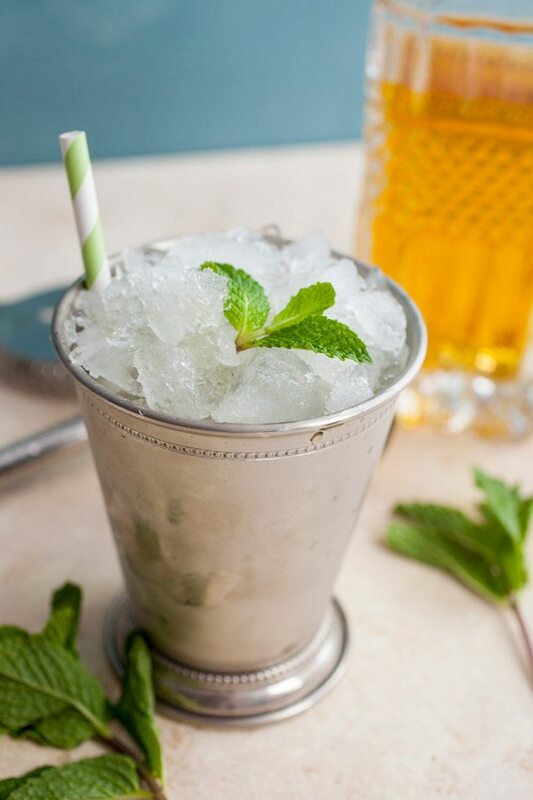 Say hello to the Mint Julep. A good one is refreshing but also packs a punch. If you’ve ever wondered how to make a mint julep, then look no further! The good news is that it isn’t really that hard and doesn’t require many ingredients. It does require lots of fresh mint and good quality bourbon. That’s pretty much it! The cocktail starts by muddling some mint with sugar. You really want to work this into a loose paste for the mint julep recipe. Then add your bourbon to the glass along with normal ice cubes to chill the cocktail down. Stir it well to combine and make sure the sugar dissolves. 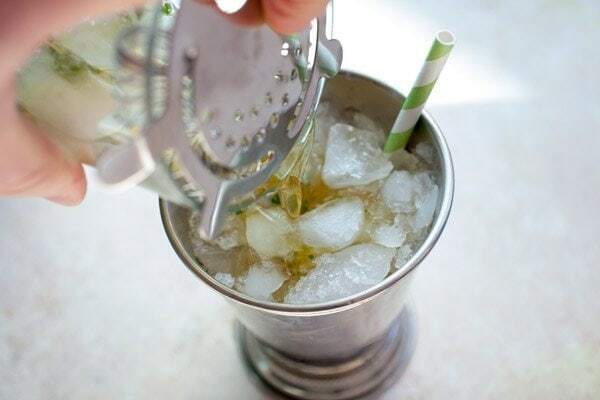 Meanwhile, get a julep cup (or any cup honestly) and fill it with crushed ice. The crushed ice is maybe the most important part of the cocktail because as it melts, it super-chills the bourbon AND also waters it down a bit. It’s a bit of a pain to make crushed ice, but it’s worth the work in this case. Once your glass is full of crushed ice, strain in the minty bourbon mix! 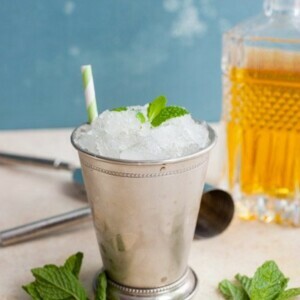 Note that a classic mint julep recipe won’t have any other ingredients in it, but a common way to lighten up the cocktail a bit is to add a splash of club soda to it at the very end. Feel free to do that if you want, but the ice will water down the bourbon as well. CHEERS! 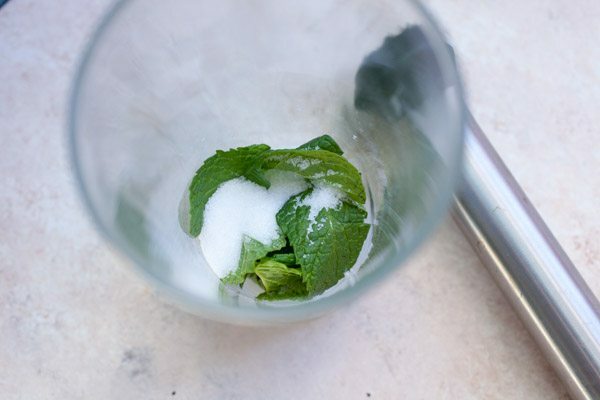 Add fresh mint leaves and sugar to a mixing glass. Use a muddler or fork to muddle the sugar and mint together to form a thick paste. Add bourbon and fill mixing cup with normal ice (not crushed) to chill. Stir to mix bourbon and sugar together well. In a julep glass (or any cocktail glass honestly), fill with crushed ice until overflowing. Strain bourbon into the crushed ice. Garnish with fresh mint and serve with a straw. Optionally, add a splash of club soda to lighten up the cocktail a bit, although it will also dilute as the ice melts.